Everything is good in coal ! Do you know the charcoal? This 100% natural product is a true concentrate of benefits for the body. A gold mine in which to draw, for a beauty sparkling certainly, but without having the skin that shines. Are you burning to know more? Focus on this beneficial ingredient with reputation not sulphurous, but unjustly misunderstood. - The vegetable charcoal, What is that ? Vegetable charcoal is obtained by first calcining wood bark (willow, ash, poplar ...), cores (olive) or fruit shells (coconut). A second heat treatment at very high temperature (600 to 900 Â° C) makes it possible to activate the properties of the plant charcoal, which then becomes "active" or "activated": its adsorbent capacities are then multiplied tenfold, thus increasing its benefits! Taken from antiquity, vegetable charcoal is a 100% natural and effective remedy. The Egyptians already used it for its medicinal virtues, but also for purifying water. In his writings, Hippocrates of Cos, Greek philosopher and founding father of medicine, also praised the benefits of vegetable coal. - Find the benefits of vegetal coal in two of our flagship products. Conquered by the many benefits of vegetal charcoal, our laboratories have developed a beauty mask and a nice little soft sponge to allow you to have a radiant face under all circumstances. 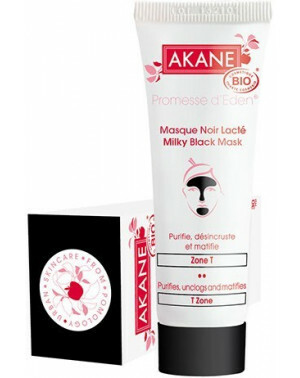 The Milky Black Milky Mask: thanks to its triple action, our unmistakable organic black milky mask will seduce you. It purifies, de-incrusts and matifies your skin, for a triple setting in beauty. Sharp, soft and matified your skin becomes sublime, inevitably. This mask is used alone, in duo and even in trio as part of a multi-masking routine. To enhance the effectiveness of the mask, crack for our Black Konjac Sponge. 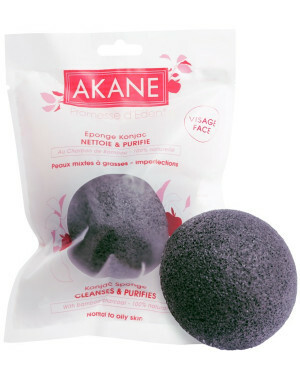 This sponge, made of 100% natural konjac fibers, is rich in bamboo charcoal. This is the essential accessory during your make-up removal routine to quickly and smoothly remove impurities and excess sebum. This japanese sponge is made from Konjac tuber, exfoliates gently, cleans the skin of the face in depth and tightens the pores. Its formula enriched with bamboo charcoal is suitable for combination to oily skin, prone to imperfections. 100% natural origin and biodegradable. The purifying and detoxifying properties of charcoal are particularly adapted to the requirements of mixed to oily skin. You are now conquered by the benefits of charcoal? Quiet ! do not repeat it or only to your best friends under pain of seeing its reputation spread like ... a trail of powder! * adsorption is the inverse of absorption: a solid retains on its surface gases, molecules.